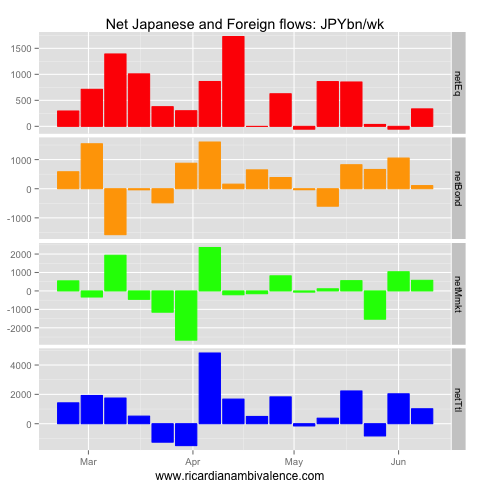 The BoJ wrote some cheques that Mrs Watanabe keeps cashing… In the week to 8 June, net-net securities flows again led to a significant inflow into JPY: this time of ~Y1tn. In the week to 8 June, this was mostly due to money market flows (Y570bn, and probably FX hedged); however excluding these, both the equity account (Y335bn) and bond account (Y107bn) delivered chunky inflows. Japan Inc. sold foreign term assets; foreigners sold JGBs and bid the dip in Japanese equities. 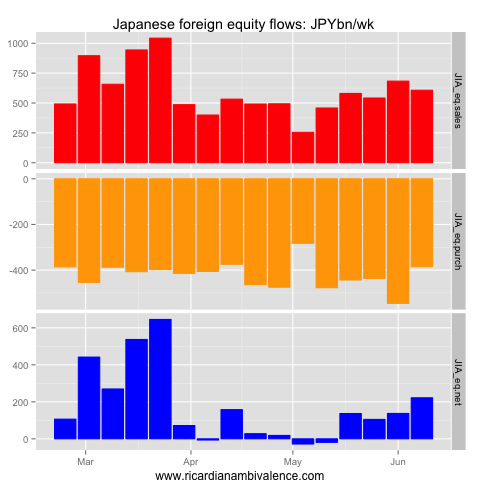 On the Japanese side, there were chunky net inflows from both bond (Y387bn) and equity accounts (Y222bn); money market flows were close to net-flat (~Y54bn). 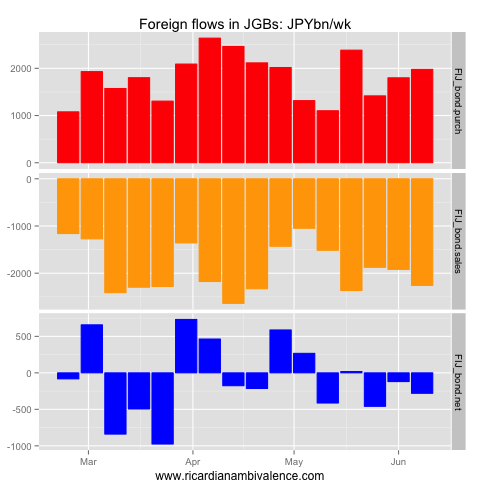 Summing across securities, the flows amounted to Y555bn of JPY buying. The pace of Japanese trading in foreign bonds slowed: with both fewer sales and fewer purchases. 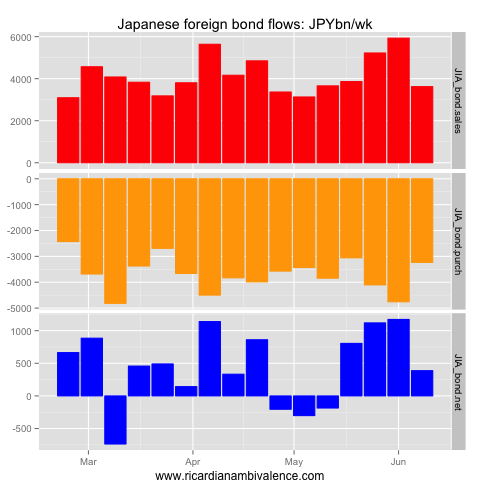 On net, the Japanese continued to sell foreign bonds (on net), with a modest Y387bn of inflows from transactions in foreign bonds. Japanese sales of foreign equities remained elevated, and purchases declined somewhat, leading to a net inflow of Y222bn from transactions in foreign equities. Money market flows picked up sharply in the first week of June. 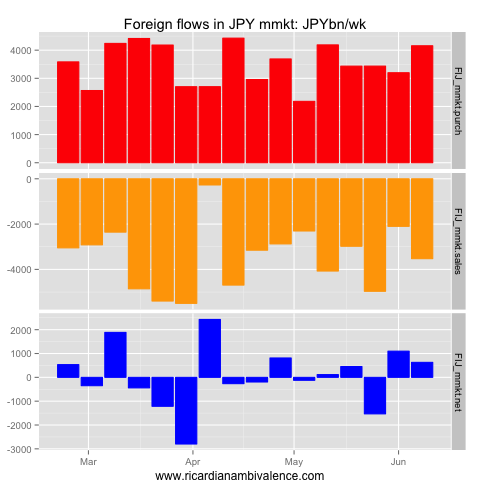 Purchases picked up a little more (Y356bn) than sales (Y302bn), resulting in a net inflow to JPY of Y54bn from Japanese transactions in foreign money markets. 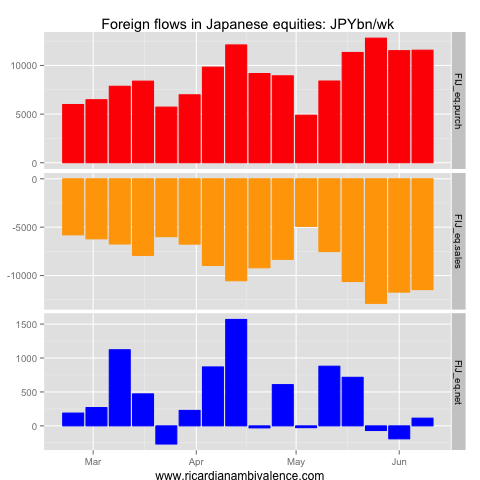 The volatility has not (yet) scared the foreign sector away from Japanese securities. 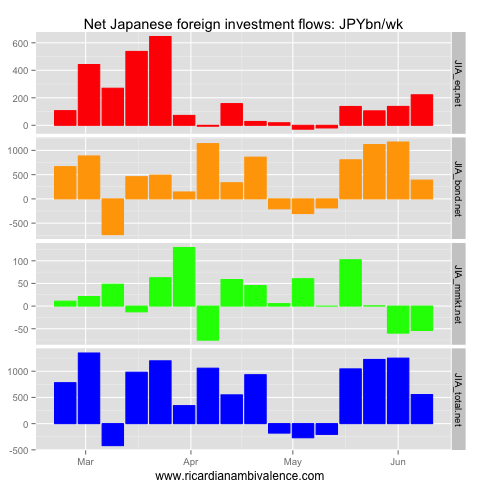 In the week to 8 June, the foreign sector net purchased Y463bn of Japanese securities. 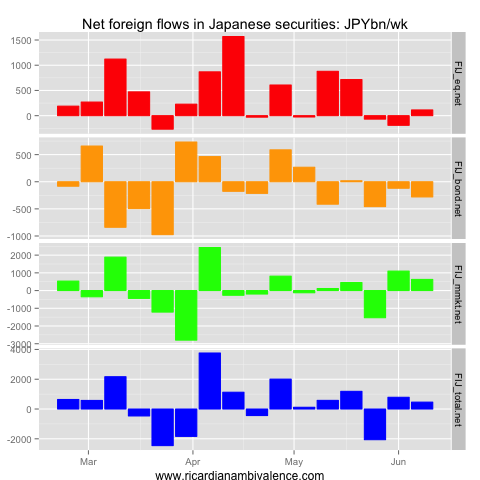 This was mostly due to inflows to japanese money market instruments (which are typically FX hedged): the there was a net outflow of Y166bn from term Japanese securities. Foreign sales of JGBs picked up a little, reaching Y2.25tn in the week to 8 June. Purchases have also been rising, and hit ~Y2tn in the week to 8 June, leading to a net Y280bn outflow from Japanese securities on the bond account. Foreign flows in the equity market show a certain amount of courage — I am surprised to learn that foreign investors have been net-buying the dip! Purchases were Y11.56tn in the week to 8 June, and sales were Y11.45tn, for a net inflow to Japanese equities of Y114bn in the week to 8 June. 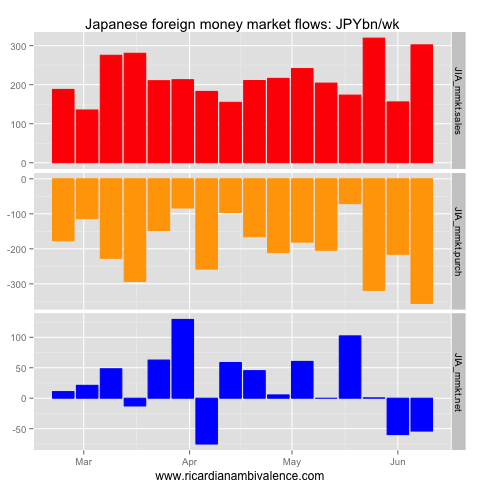 Foreign flows in the Japanese money market also picked up. Purchases rose to Y3.53tn and sales rose to Y4.16tn, for net foreign purchases of Y630bn over the week.